The Assign Multiple Cross Sections command enables the user to select a group of existing polylines on the Map View as cross sections and have the software extract the HEC-RAS cross section geometry from the underlying ground terrain. From the Input ribbon menu, select the Cross Sections menu item and then choose the Assign Multiple Cross Sections command. The Assign Multiple Cross Sections dialog box will be displayed. The following sections describe the Assign Multiple Cross Sections command and how to interact with the above dialog box. This section is used to interactively select polylines from the Map View for assigning as HEC-RAS cross sections. Click the [Pick] button and the dialog box will temporarily disappear. A prompt will be displayed on the status line, informing the user what to do next. Within the Map View, click on the polylines to assign as cross sections. To select all the polylines on the same map data layer, first select one polyline on the Map View. Then right-click and choose Select Similar from the displayed context menu. The software will then select all the polylines contained on that layer. When done selecting the polylines, right-click and choose Done from the displayed context menu or press the Enter key. The Assign Multiple Cross Sections dialog box will redisplay showing the number of polylines selected. Note that cross sections cannot already exist for the corresponding river reach. If cross sections already exist, then instead use the Assign Cross Sections command as described here. This section is used to define the river stationing of the selected cross sections. After selecting the cross section polylines, the software will automatically compute the river station of the cross sections based upon the parameters defined in this section. For the cross sections being constructed, the river stationing value after the decimal point can be defined using the Decimal precision spin control. Cross sections can be numbered using a fixed increment or by the river chainage along the river reach. The river chainage can be in miles or feet when working in US units, or kilometers or meters when working in metric (SI) units. This tabbed panel is used to define the data extraction specifications for the assigned cross sections. 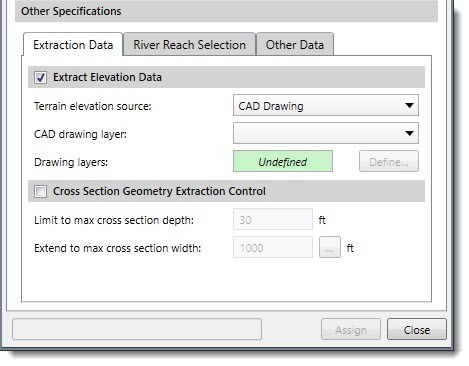 This optional section is used to define the elevation data source to be used for extracting the cross section geometry. Depending upon the elevation data source type that is selected, different options are provided to specify additional elevation data information. See this section for information on the types of terrain elevation data that can be used for constructing cross sections. If the section checkbox is unchecked, then the subsequent sections below it will be unavailable (i.e., grayed out). In addition, no geometry will be created when the cross section is created. The cross section will just be a flat horizontal line at elevation 0. This optional section is used to control the amount of the cross section geometry to extract for the selected polyline. This assures that an adequately deep enough cross section is created on both sides of the river reach. The software will attempt to retrieve the cross section geometry data to the depth specified within the maximum cross section width specified. If the selected polyline does not extend outward far enough to get the cross section depth specified, the software will automatically extend the constructed cross section further outward. Similarly, if the selected polyline extends too far outward for the depth specified, the software will automatically trim the constructed cross section. 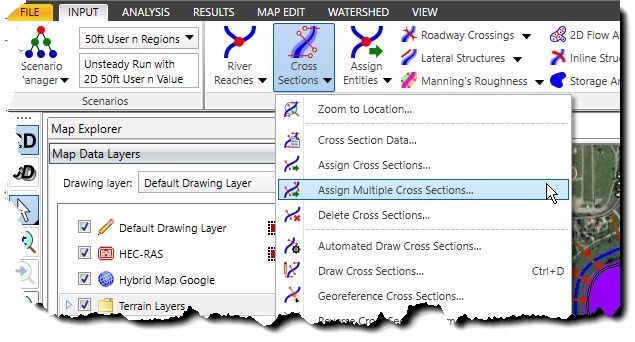 This tabbed panel allows the user to define whether the Assign Multiple Cross Sections command should be applied to all river reaches contained within a project, or a specific river reach. 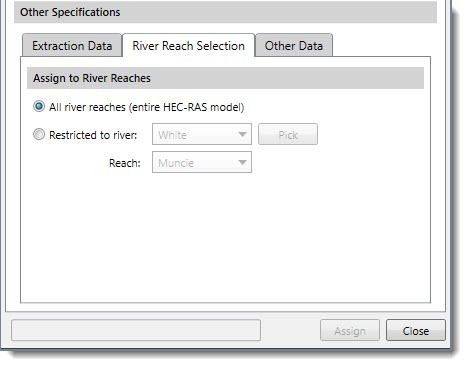 All river reaches (entire HEC-RAS model): This option allows cross sections to be assigned to one or multiple river reaches within the model. 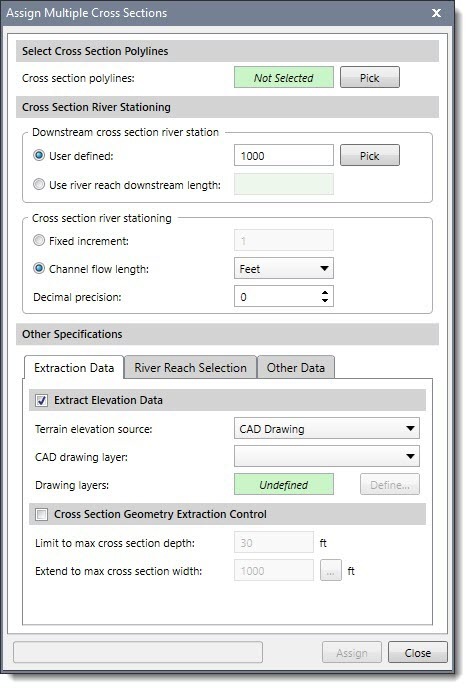 Restricted to river reach: This option allows the user to select a specific river reach for cross sections to be assigned to. Selected cross section polylines that do not overlay the defined river reach will be discarded. This tabbed panel is used to define channel bank locations based upon the options selected for the constructed cross sections. 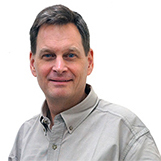 This option will assign the bank stations using a defined channel width. The software will first determine where the thalweg location is on the cross section. It will then move outward from the thalweg equally until the requested channel width is reached. 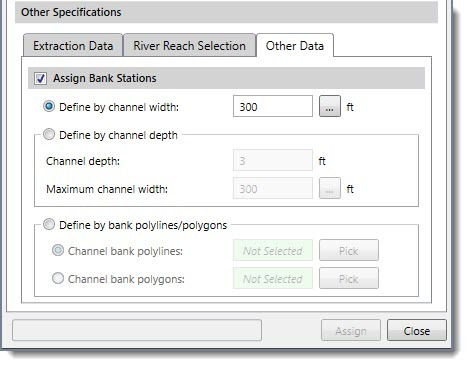 This option will assign the bank stations using an assumed normal flow depth and a maximum channel width search distance. The software will first determine where the thalweg location is on the cross section. It will then move outward from the thalweg until the requested channel depth is reached within the maximum channel width specified. This option will assign the bank stations using selected polylines or polygons. The software will first determine where the thalweg location is on the cross section. It will then move outward from the thalweg until a previously selected bank polyline or polygon edge is reached. During the construction of the cross sections, the software will automatically assign a default Manning’s roughness for the left overbank, channel, and right overbank areas. In addition, the cross section flow lengths are automatically determined.